Thinking of buying a hunting vehicle this year? Prevent buyer's remorse. Finding the vehicle that works for you depends on your style of hunting and living. To uncover that, ask yourself the following six questions. Then, go one step higher than you think you'll need. That gives you flexibility and helps you avoid the regret that comes after getting stuck miles away from your truck or being unable to access good hunting sites. 1. How Will You Use the Vehicle? Most people use their vehicles for more than hunting. Do you plan to cruise the beach? Do chores around your land? Go trail riding? Knowing this up front will help you get more miles for your dollar. You'll also need to think about where you'll be hunting. If you plan to park your vehicle on the side of the road and walk to the hunting site, a pickup or Jeep may be right for you. But if you want to drive into the woods, an all-terrain vehicle (ATV) or utility transportation vehicle (UTV) will be a better options. ATVs vs. UTVs: What's the Difference? If you're looking for a fast, nimble, less expensive vehicle, consider an ATV. Originally designed for trail riding, these lightweight gasoline-powered recreational vehicles are easy to trailer and hide. They feature a motorcycle-style seat and handlebars with a throttle and brake lever. On the downside, ATVs are designed for one rider and they don't have cargo beds. They can comfortably carry only a guy and his gun. ATVs are not good work vehicles, and there are no cabs for safety or weather protection. UTVs, on the other hand, are a cross between a pickup and an ATV. Designed specifically for off-road use, they are great for hunting, work and neighborhood transportation. These multi-purpose vehicles drive like automobiles and have cargo beds, but they have smaller wheel bases than trucks, so they can weave in and out of trees and navigate narrow paths. Like ATVs, UTVs are easy to trailer and hide. Many come with seat belts and roll over protection systems. And they're available in a range of models. Club Car XRT UTVs, for example, are available in a variety of styles; in gas, diesel and electric power; in two to six-passenger models; and in two or four-wheel drive. But UTVs are a bit more expensive than ATVs, and they're not quite as nimble. 2. How Many Passengers Do You Want to Carry? 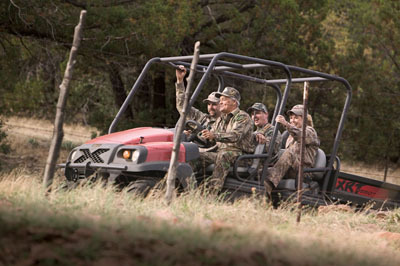 If you want to hunt with family and friends, think ahead and select a vehicle large enough to accommodate your party. That may not be a pickup or ATV. 3. Gas, Electric or Diesel? People often think they need to buy a gas or diesel-powered vehicle to get a longer range, but that's not true. Electric vehicles will also give you sufficient range for a good day's hunting. In fact, seasoned hunters often prefer electric vehicles because they don't create fumes and noises that frighten animals, so they help preserve your hunting area. If you buy a gasoline or diesel-powered vehicle, look for a big tank and long range. 4. Two- or Four-Wheel Drive? That depends on how far off the beaten path you venture. If you mainly travel trails, a 4x2 may be fine. If you'll be crossing creeks; driving in snow, rain or mud; climbing hills; or covering rocky terrain, you'll want a 4x4. A 4x4 will get you into prime hunting areas and help you avoid getting stuck in the woods. And 4x4s come with seat belts and roll over protection systems. Compare Four-wheel Drive Systems. If you've got your heart set on a 4x4, do your due diligence. There are big differences in ease of use and performance. With most four-wheel drive systems, you'll have to push the right levers, select the right gears and worry about locks. But all Club Car XRT 4x4s are equipped with the IntelliTrak all-wheel drive system. You select 'forward' or 'reverse' and IntelliTrak does the rest. What's more, most four-wheel drive utility vehicles require you to come to a full stop - or even back up - to engage the locking differentials. Not so with Club Car XRTs. IntelliTrak takes you from a low gear to a high gear without stopping or manual shifting. The clutches automatically shift up and down based on speed and load. The system senses the ground you're on and delivers the power you need to navigate it. 5. What About Ground Clearance and Axle Articulation? If you want to get into extreme terrain, you'll need a 4x4 UTV with excellent ground clearance and good axle articulation. Axle articulation is the ability to travel uneven terrain while maintaining ground contact on all four tires and preserving traction and torque. Club Car's XRT1550 offers unparalleled axle articulation. Its four-link semi-independent rear suspension delivers independent performance with solid axle strength. 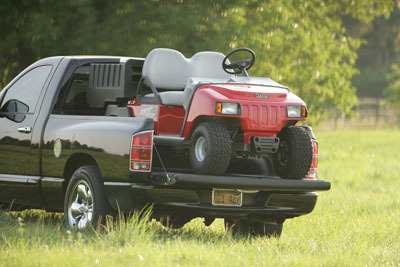 The world standard for Jeeps and Land Rovers, the system is unique to Club Car in the U.S. UTV market. And it offers eight inches of ground clearance, even when fully loaded. This vehicle is excellent for hunting, and it's a real workhorse. Compare bed size and payload. These can differ considerably from model to model and manufacturer to manufacturer. Look for a vehicle designed to accommodate the hunting accessories you want. At Club Car those include floor-mounted gun racks, canopy tops, windshields, nerf bars, brush guards, camouflage paint, heaters, stereos and more, all designed specifically for Club Car XRTs. Think about comfort and safety. If you decide on a UTV remember this. 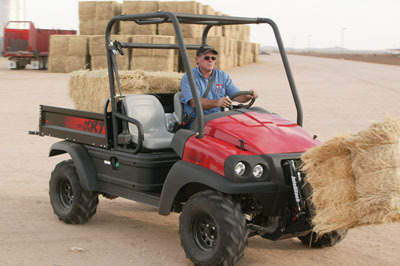 Some UTVs evolved from ATVs and have light tires and components. Others evolved from cumbersome lawn equipment or tractors and lack comfort and style. But Club Car XRTs carry the company's 50+ year legacy of being the world's leading producer of golf and utility vehicles. 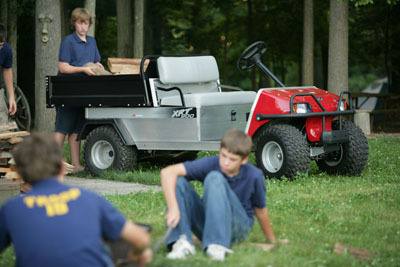 This shines through in the engineering, design and style of Club Car XRTs,. Finally, search for the longest, strongest warranty you can find. 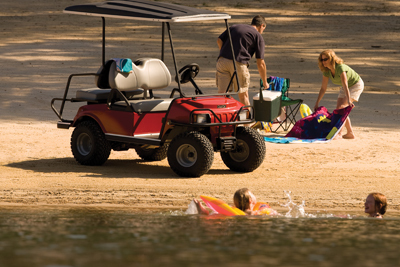 Club Car XRTs are covered by a two-year limited consumer warranty, the longest in the industry.